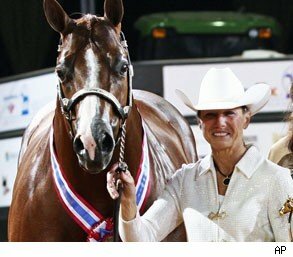 DIXON, Ill. -- The former financial officer for the small northern Illinois city of Dixon stole millions of dollars more than originally thought, federal prosecutors said Tuesday as they announced plans to try to seize Rita Crundwell's trucks, boats, horses and even theunborn foals she owns. A federal grand jury on Thursday returned an indictment charging Crundwell with one count of wire fraud for allegedly siphoning more than $53 million from the city of 16,000 since 1990 into a secret account she controlled. Prosecutors originally alleged she had taken $30 million. Prosecutors contend that Crundwell used the money to pay for a lavish lifestyle as she worked as comptroller in Dixon, the boyhood home of the late President Ronald Reagan. Prosecutors filed a civil lawsuit Thursday seeking 311 registered quarter horses and dozens of foals that are expected to be born this spring. A news release announcing the suit said prosecutors plan to sell the horses and "apply the proceeds toward restitution to the city of Dixon." Prosecutors said the horses are subject to forfeiture because Crundwell either bought or "maintained them with criminal fraud proceeds." At the same time, the indictment seeks criminal forfeiture of two residences, a horse farm in Dixon and a home in Florida. It also seeks a $2.1 million motorhome, more than a dozen trucks, trailers, motorized farm equipment, a pontoon boat, and cars, including a 1967 Chevrolet Corvette roadster. The indictment also seeks the forfeiture of more than $224,000 in cash from two bank accounts. Federal prosecutors allege Crundwell created phony invoices that she characterized as being from the state of Illinois. She then allegedly put that money from a city account into another account, which she repeatedly used for personal use. According to the news release, she said she used the state's much-publicized dire financial straits to her advantage, telling city officials that the state was late in payments as a way to conceal her transfers of funds and her spending. If convicted, Crundwell faces a maximum sentence of 20 years in federal prison. The former comptroller will be arraigned May 7 in U.S. District Court in Rockford. Crundwell's attorney was not in his office Tuesday and in a recorded message he said he would not be back in the office until Wednesday. Crundwell couldn't be reached; the phone rang unanswered at a listing for her.